Will Sea of Thieves be the new No Man’s Sky? When Hello Games’ No Man’s Sky was finally released in 2016, it stole headlines everywhere for all the wrong reasons. It’s not that the game was a completely irredeemable mess, but rather that it failed to deliver on creator Sean Murray’s biggest promises. We were expecting a space adventure that would allow us to explore a nearly infinite universe and discover the mysteries of countless worlds. What we got was a game that mostly had us digging for resources across a surprisingly sparse universe. If No Man’s Sky had been released without the level of hype that surrounded it, people might have viewed it as an interesting experiment. Instead, it was simply reviled. Since then, No Man’s Sky has gotten better. A series of updates have not only restored much of its promised content but added to the core game in surprising ways that capitalized on the things the game does well. Yet…few of the game’s post-release improvements seem to matter. No Man’s Sky is still associated with a kind of elaborate scam that people are angry they bought into. They’ve promised themselves they won’t be fooled again. It’s a situation that Sea of Thieves might soon find itself in. Sea of Thieves is a multiplayer pirate game that allows you and your friends to sail the unfriendly seas and engage in pirate shenanigans. If that sounds awesome, it’s because it is. Playing Sea of Thieves with your friends is an incredibly enjoyable experience that will surely put a smile on your face for at least the first couple of hours. Beyond that, though, it becomes clear that Sea of Thieves has very little to offer. Most of its missions involve you just finding something and bringing it to someone for a reward. Interactions with other players are almost entirely limited to simple combat. Worst of all, the number of pirate shenanigans you can actually get into are embarrassingly limited. That isn’t to say that Sea of Thieves is a “bad” game. It’s not, However, it’s a game that feels like a snapshot of the game that you really want to be playing. Sea of Thieves probably sounds a lot like No Man’s Sky at this point, but that’s not an entirely fair comparison. Whereas No Man’s Sky promised the universe and delivered a thimble of dirt, Sea of Thieves is pretty much the game we were told it was going to be. It’s even the game that we were allowed to play during the title’s beta period. It’s just that people thought that developer Rare was going to deliver something…well…more for the final game. So far as the developers go, they’ve stated that they intend to add much more content to the game in the months to come. There’s currently no reason to suspect that they won’t. 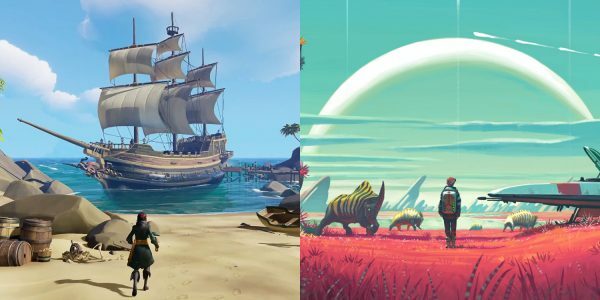 Sadly, the one similarity that Sea of Thieves does have with No Man’s Sky is that we’re not entirely sure anyone will still be around by the time that Sea of Thieves finally becomes the game that it can be. While we hope that the initial promise of Sea of Thieves will inspire players to return to it once more content is available, it’s not clear at this time whether it’ll be realistic to expect players to band together every few months, digest all the content, and then repeat that process in the years to come. As it stands, it’s hard to see the beautiful horizon for Sea of Thieves to sail to. Next Next post: PlayStation VR Is Cheaper Than Ever. Here are the VR Games You Need to Own.